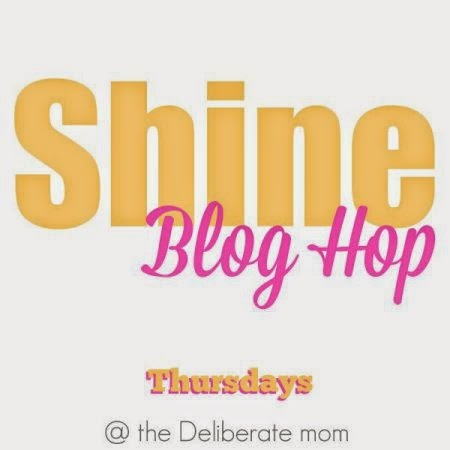 I may be one of the last mom-bloggers to stumble onto the SHINE Blog Hop hosted by Jennifer at The Deliberate Mom but I'm so glad I did. I found it through a link from another blog I read, Little Earthling Blog. Each week bloggers are invited to share two blog post through the link up. It's a great opportunity to find new blogs and more importantly, a chance to connect with other bloggers. This week it looks like there are recipes, costume ideas, parenting ideas, and so many others. I shared two posts: Toes and Ej Jematen Ri-Majel Kia!. Click through the link below or the button on my sidebar and check it out- who knows what great blogs you'll find! Thanks so much for this wonderful post about the SHINE Blog Hop. I'm glad you're enjoying it so much. It is a lovely community and I'm glad you're feeling that way too.